A couple of years ago I suggested that we might, just might, not have mashed potatoes at Thanksgiving. The food lover in me thought it might be interesting to try a new take on potatoes and branch out a little. I almost had to go into witness protection to avoid the wrath of my family. Mashed potatoes are apparently sacred. All kidding aside, I learned an important lesson that had I thought about it I would have already known: the food traditions associated with Thanksgiving are almost as important as the food itself. Generally, this is one time of year most people don’t want to be surprised. They aren’t particularly interested in having their notions or their taste buds challenged. And, as a hostess, my role is to make them happy and comfortable, so I’ll give them what they want. After some further investigation, I have discovered that my family is amenable to some variation on the Thanksgiving menu as long as the base traditions aren’t in jeopardy. Among our Thanksgiving crew I can experiment with turkey preparations as long as I stick with a traditional turkey – they aren’t quite ready for a heritage bird yet. Also, they’ll tolerate new and interesting stuffing preparations as long as Granny’s traditional cornbread dressing is there to keep us all honest. And most interestingly, they are open to new and interesting vegetables and starches as long as green beans and mashed potatoes make their requisite appearance. This year I’ll be adding an sourdough, apple, and chorizo stuffing option as well as a butternut squash and poblano gratin to the menu as the “new and different” dish (made with Hatch Chiles of course). Butternut squash is familiar enough that people won’t look too askance at this new offering on the table, and who knows, it might even become a new family favorite. 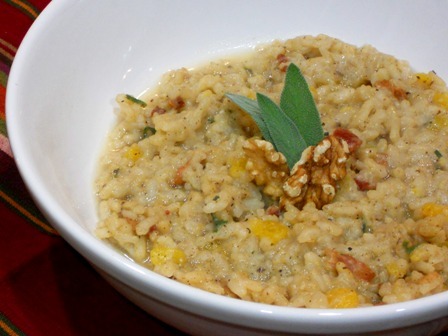 If like me you have the opportunity or desire to mix up your Thanksgiving table a bit, but want to stick with a few traditional flavors, this recipe for butternut squash risotto might be the perfect place to start. With a flavor and texture similar to sweet potatoes, the squash won’t be totally out of place on the menu. Risotto isn’t a typical American Thanksgiving dish though, so it will be fun and just unexpected enough to make people sit up and take notice. And if you’re worried about the fact that risotto requires so much attention and last minute preparation, never fear! I share the secret to make-ahead risotto in the “Recipe for Success” section at the end of the recipe. So go ahead, branch out this Thanksgiving! Bring the broth to a simmer in a medium saucepan and keep warm over low heat. Cook the bacon over medium-high heat in a separate medium sauce pan until the fat is rendered and the bacon is crisp. Remove the bacon from the pan and reserve for garnish. Pour off all but 3 Tbsp. of the bacon fat. Reduce the heat to medium-low and add the red onion. Cook until it is soft but not browned, about 5-7 minutes. Add the butternut squash to the pan and sauté for 2 minutes. Stir in the rice and cook until it is well-coated with the bacon fat and begins to turn translucent, about 1-2 minutes. Add the wine and simmer until all of the liquid is absorbed, about 3-5 minutes. Add about 1 cup of the warm broth to the rice and stir regularly until the liquid is absorbed, about 3-5 minutes. You’ll know the liquid is absorbed when you run your spoon through the rice and liquid doesn’t immediately fill the bottom of the pan. Repeat, adding broth 1 cup at a time, until the rice is al dente (cooked through but still firm), about 18-22 minutes. While you don’t have to stir the rice the entire time, you shouldn’t leave the rice unattended for more than a minute or two and do stir the rice frequently. When the risotto is done sample it and add salt and pepper to taste. Ladle the risotto into a serving bowl and finish with the bacon and any of the other recommended garnishes. To make this dish wholly vegetarian use vegetable broth, skip the bacon, and substitute 3 Tbsp. olive oil for the bacon fat. The time of day, the humidity in your area, and the specific type of rice you buy will all contribute to how long it takes your risotto to finish cooking and how much stock you need. You may not use all of your stock, or you may need to heat a little water in a tea kettle or in the microwave if you run out of stock and still need a little more liquid. The key is to start tasting the risotto at the 18 minute mark and keep adding liquid a little at a time until it is done. Use a crisp white wine or even sparkling wine for this recipe. Avoid overly oaky wines or sweet wines as they will not fit well with the flavor profiles of the other ingredients. You can also leave the wine out entirely and substitute additional broth. You can make this risotto ahead and finish it just before you serve dinner. Cook the rice until almost al dente but not quite done, about 16 minutes. The rice should still have a firm bite when you taste it. Spoon the risotto from the sauce pan onto a rimmed baking sheet and spread it evenly over the sheet. Put the baking sheet into the refrigerator immediately so the rice can cool quickly. When the rice is cool, cover with plastic wrap. About 15 minutes before serving, heat about 2 cups of broth in a sauce pan, return the risotto to a separate sauce pan, add a ladle of broth and continue cooking as per step 7 until the risotto is done.